There are many pleasures to being friends with a foodie. Dinner invitations promise sumptuous feasts prepared with knowledge, skill and passion. Trips to restaurants provide the ignorant amateur with new insights and experiences. Last Thursday I had the pleasure of going to the grill at Skylon, in the refurbished and renamed Southbank centre with friend and foodie mentor Ben. There is much to recommend it. The views are wonderful with high ceilings contributing to a light open and airy feel. Sit and contemplate the river or play “Where’s Wally?” with the Andrew Gormley statues. The cooking was simple and confident. The produce seasonal with vegetables from Secrett’s Farm – I am told a badge of honour amongst such establishments. 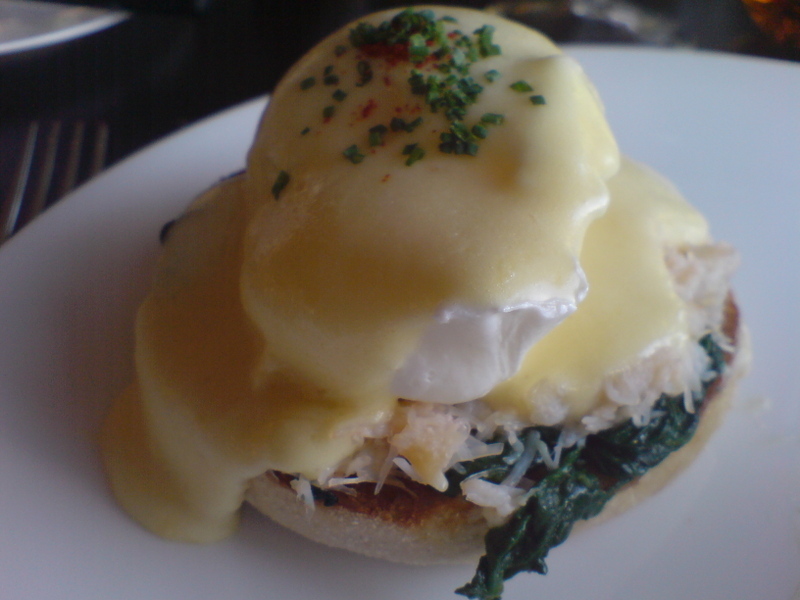 Ben opened with the eggs “Skylon” (eggs Benedict with crab instead of ham) which he tells me was good. I went with the Empress eggs – more eggs, this time with caviar and asparagus, also…well, good. For main course I had grilled sea bream which was…..like grilled sea bream and Ben had the poussin dressed up with cooked versions of Caesar salad staples – also well received. This is my first tentative foray into the world of restaurant reviews, but the discerning reader will have detected a distinct lack of enthusiasm on my part. It really was well…fine but little more. This may have been a first trip to Skylon but we have been here before. The menu was predictable; the dishes looked and tasted exactly as I expected; the décor was courtesy of the middle range restaurant standard issue unit; and the staff though helpful and professional were interchangeable with those at hundreds of London eateries. There is nothing particularly interesting, or memorable about the food. It’s ok – your partner won’t be upset if you take them there, but I doubt you’ll be talking about it by the weekend. A few specific gripes. I finished with the crème brulée. Why can’t I get a decent crème brulée anywhere? There was a time when chefs took pride in this often signature dish. It was cold all the way through (shouldn’t they be hot on top having passed under a proper grill on their way to the table?) and tasted like every other crème brulée I‘ve had in the last two years. You have to leave the restaurant to go to the toilet. Is this normal? My flat has three toilets – surely Skylon can provide its guests with one. Our wine was nestled in a bucket at the other side of the restaurant – too few buckets we were told. I understood that wine buckets were plentiful – at least in the catering industry. I should point out we were eating at the Skylon grill, not the main fine dining restaurant. Things may well be different there and I certainly hope to find out. But I fear our experience highlights a more worrying issue. Our relationship with the Southbank has been tortuous but ultimately fulfilling. Few will remember its initial reception as post-war modernism proved to be as popular in 1951 as turkey twizzlers in a Jamie Oliver cookbook. But now it is rightly one of the most visited areas of our city, and the likes of Hugh Casson are recognised as cultural icons of the 20th century. As the Southbank reopens it will host some of the best theatre, music and film in the country. Why not some of the best food as well? I am not suggesting that a “National Restaurant” be placed along side the theatre of the same name. But what are the restaurants in this prestigious and nationally important building? …EAT, Wagamamas, Strada, Giraffe (que?) and Skylon. The last is certainly a cut well above the others but this is an accolade few would take pride in. Are these places really to provide our culinary accompaniment to an evening with Fellini, Shakespeare, or Purcell? Perhaps, but then if these are your aspirations you could just as well stay at home, order a pizza and watch Big Brother. I’ll be at the Anchor and Hope, about half a mile away. Skylon doesn't have a toilet inside the restaurant because Royal Festival Hall is a listed building, and as the original People's Palace didn't have a toilet inside, there couldn't be ones added when Skylon went in.